Nitrile Rubber, or to give it it’s full name, “Nitrile butadiene rubber (NBR)” is a type of synthetic rubber that is often used where resistance to fuel, oils and chemicals is required. It is also available with food approvals and can come in the form of extrusions, mouldings or calandered sheet. Although its temperature range is not quite as wide as Silicone Rubber, it’s fuel resistance and cost per kg makes it a more cost effective alternative to Fluorosilicone or Viton Extrusions. 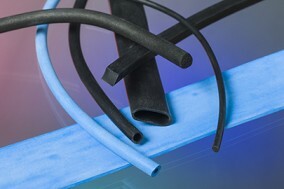 Adpol can produce Nitrile rubber extrusions in the form of tubing, cord, strip or simple profiles to your specific dimensions up to a maximum 15mm cross section outer diameter, with thin strips up to 75mm wide. Manufactured in our Worthing plant, our Nitrile rubber extrusions can be produced in a wide range of hardnesses and colours to suit your exact specification. Adpol can also compression mould in many grades of polymer including Nitrile rubber and provide flat gaskets stamped or water jet cut from sheet with adhesive backing where required. Please contact us for more information or a no obligation quotation. We manufacture in lots of different rubber grades so if Nitrile isn’t quite what you need, or something else will give you better results we will try and suggest it.